Personalized princess lunch tote. 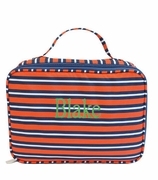 Dress your little one for school and complete the outfit with a gorgeous lunch box. She will be delighted with the fun themed design that features beautiful princesses surrounded by magical horses, hearts and crowns in trendy colors of pink and purple. A quilted heart pattern in pink and white contrasts neatly with the pictures and a blue handle and blue trims complete the design. The bag offers a large main compartment and an extra front pocket, both easily opened and closed using zippers. The mesh pocket located on the side is ideal for holding a drink bottle. Matching backpack available, search item SJ-1120-04.